A painter's palette can imply two different yet equally important components of an artist's kit of tools. The first definition is the actual item that the painter mixes his colors on. Wood, plastic, tear-off paper and even tin are some of the options. 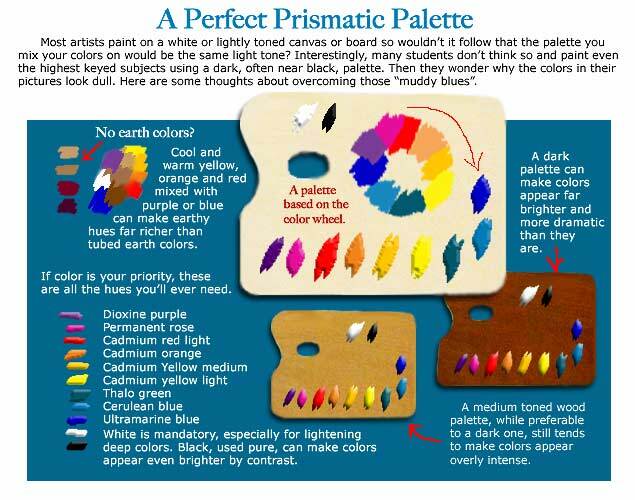 The second definition for palette is the selection of colors an artist lays out to paint with. Some use as few as three or four; others, as many as twenty five. Both types of palettes are indispensable for the creation of a picture and time spend exploring options is time well spent. My take on this important aspect of painting craft is illustrated here. But don't forget, you may have other priorities, so check out what I have to say, retain the parts that relate to your particular needs and jettison the rest.